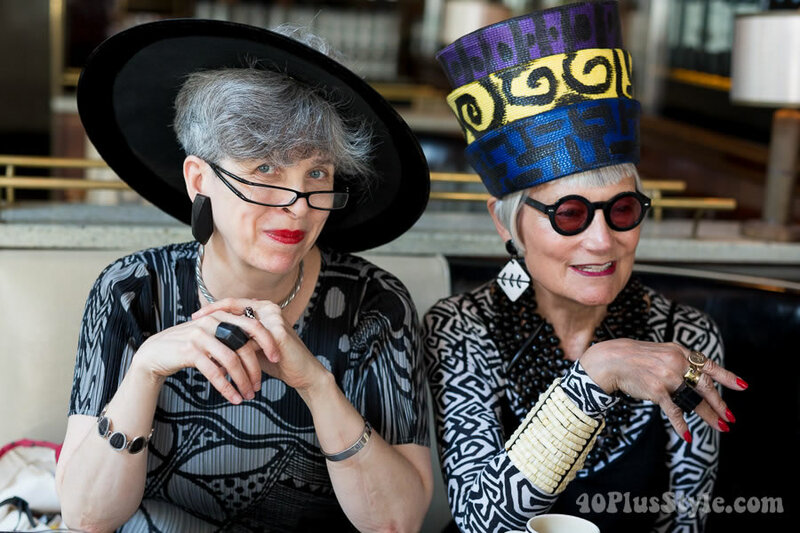 I have followed Valerie and Jean’s blog Idiosyncratic Fashionistas for many years. I love their style and their take on the wonderful events they discuss on their blog. In New York I had the chance to meet them and ask them everything I always wanted to know! They are the most gorgeous and interesting women and you will love their detailed responses to my style questions as well as their responses to my questions in a short video interview. Can you tell us a little bit more about yourselves? We met in 2008 at a vintage clothing show, and the rest, as they say, is history. We had a lot of mutual friends and mutual interests and figured out that an adventure or an event is so much more enjoyable when it is shared. When you can immediately react to the same things, not necessarily in the same way, it makes life that much more interesting and fun. Valerie: I think people can more or less figure out my age, but I’m not going to volunteer it. I’m very comfortable with my age, but this is still a society that worships youth. I will probably have to work until I die, so it’s not in my best economic interests to disclose it. Jean: I am older than Valerie and am in my sixties. Many of my friends have retired, but I’m still working full-time because I still love what I do. When it stops being fun, then I’ll retire. 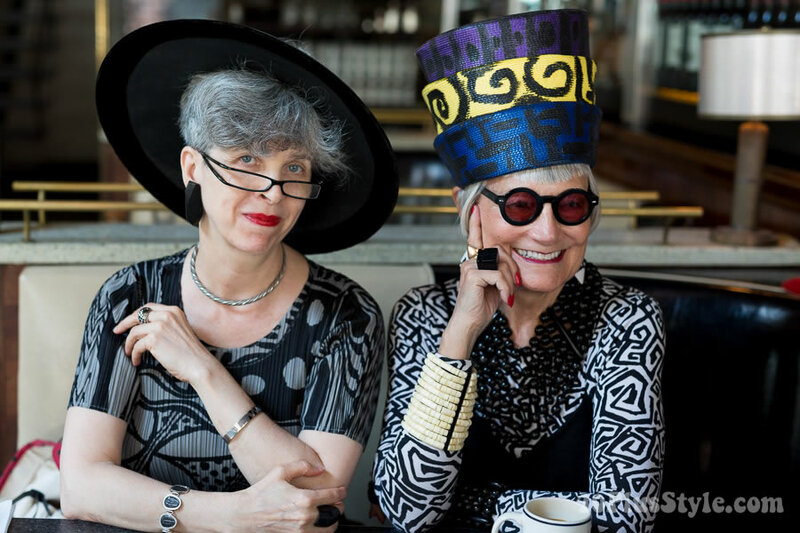 Can you tell us a bit more about your website Idiosyncratic Fashionistas and why you created it? Jean: It is technically not a website; it’s a blog (in case that makes some sort of difference). 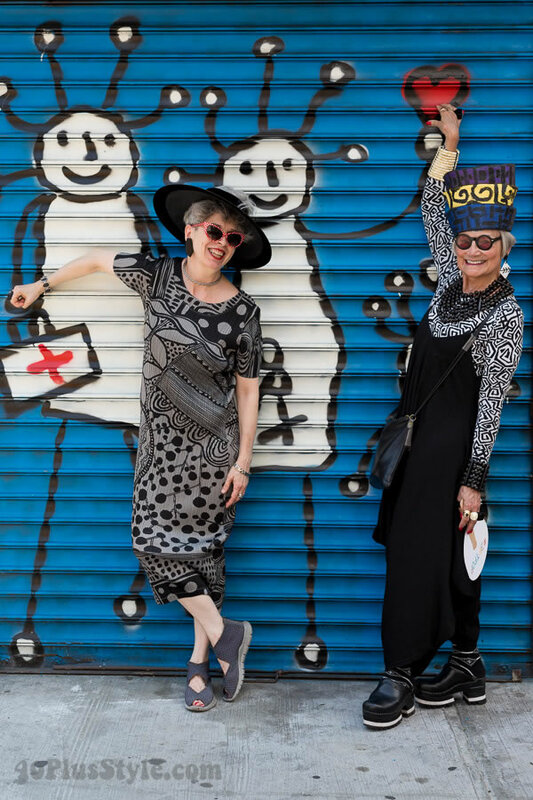 Although we call ourselves “Style Bloggers of a Certain Age, setting a bad, bad example for older women everywhere”, our followers span generations, nicely in keeping with our philosophy that style is ageless. Valerie: We started it because so many people asked us to! We had no thoughts of starting a blog. Originally, blogging involved special software programs and a knowledge of html, so we thought it would require a big investment of time and money. 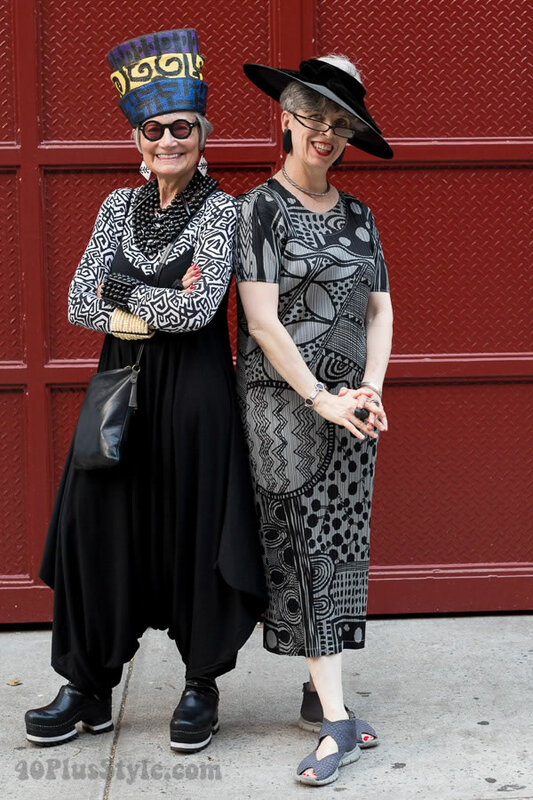 But strangers on the street kept stopping us and asking if we were stylists, artists, or designers. When we told them we weren’t, they asked if we blogged. When we asked what we would blog about, we were told to blog about ourselves. And when we asked who would read a blog about us, they said “We would!” So when we learned about BlogSpot, which required no knowledge of computer programs, needed no monetary investment and uploaded photos at the touch of a button, we figured ‘Why not’? We really kind of backed into it, almost as if it were a dare. We did not start it as a way to bring attention to the thoughts and lifestyles of older women, but rather as a means to air our thoughts and lifestyles. Early on, though, it came to be regarded as a voice for older women. While we never expected the amount of support we’ve received, we do very much appreciate it. You both love your hats. Do you wear hats all the time? Why is a hat so important to your style? Valerie: I started wearing hats when I was a teenager out of necessity because I am very vulnerable to the cold. 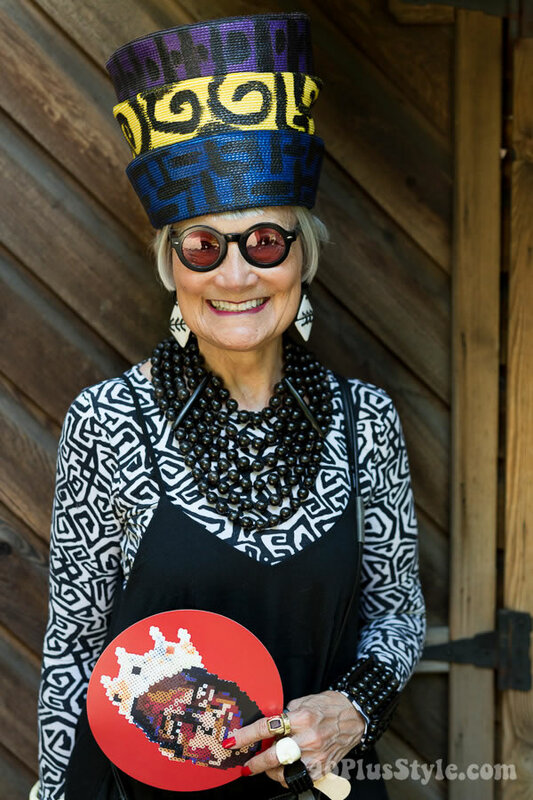 In the late 1970s, when I worked in retail, I was able to buy a number of Patricia Underwood hats so I could be not just warm, but warm and stylish. After that I was hooked. When I began to frequent the flea markets in the 1990s I found numerous beautiful and artfully constructed vintage hats at bargain prices. Often I wore them, but sometimes I just bought them because I felt they needed to be preserved and respected for their amazing workmanship. I love hats because they’re very versatile – they can be almost any shape or material, and any color, and they can dramatically change the tenor of any outfit. A good hat is a better conversation starter than a puppy, and it doesn’t need to be walked twice a day. If you have no use for hats, you’re in good company. 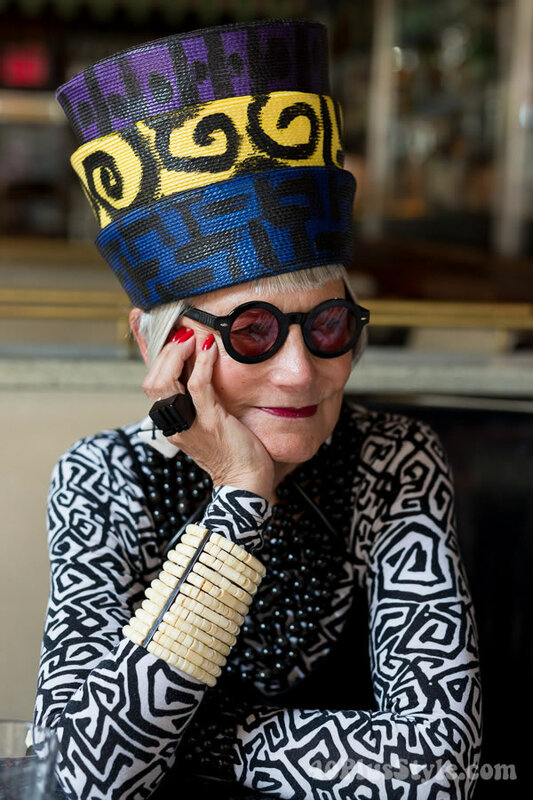 It’s absolutely possible to be stylish without a hat – look at Diana Vreeland, Iris Apfel, Millicent Rogers, or Tilda Swinton, just to name a few. Jean: My mother was what we used to call “a clothes horse”. She went to a lot of parties, entertained a lot, and liked to dress up. She had an impressive collection of serious hats, including a lot of turbans, and some evening hats that looked like what we now refer to as “fascinators”. I had long, straight hair until after grad school and didn’t wear a lot of hats until later, when I had shorter hair. I began collecting mostly modern hats. 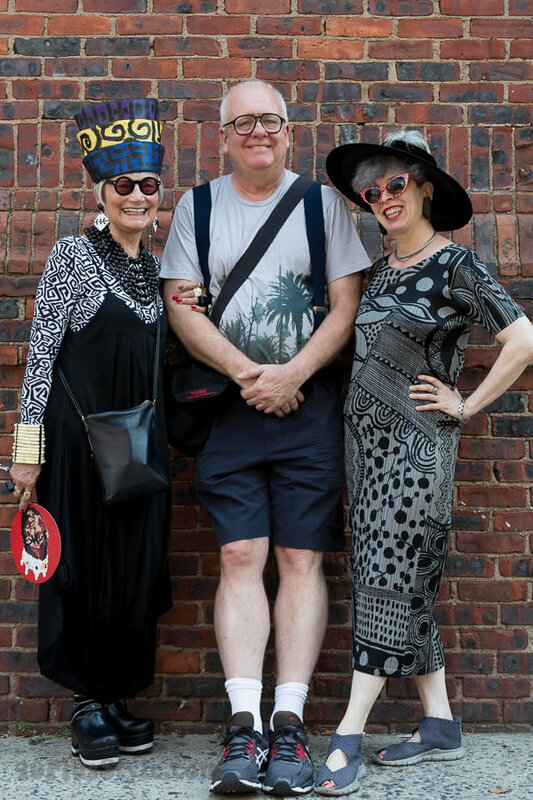 It wasn’t until I was in my thirties, forties and fifties that I started to incorporate pieces of vintage clothing and accessories into my wardrobe and at that point, vintage hats were a natural fit. I wear hats almost all of the time, but not in the office. If I’m going out after work, I’ll wear a hat to and from. The security guards at my office building provide a LOT of positive reinforcement. 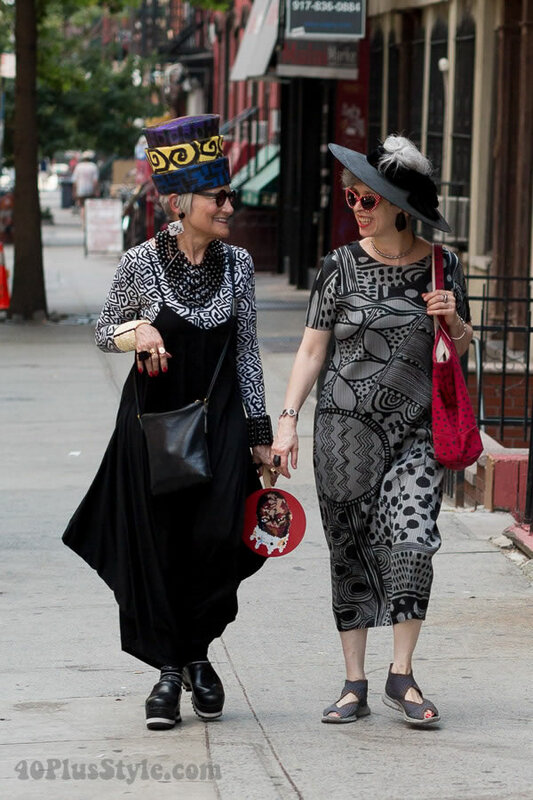 Do you have any tips for other women who would love to incorporate a hat into their style? Jean: I think that women who don’t like hats simply haven’t found the right one yet. If you really want to wear hats, keep looking and trying them on until something “clicks”! What about straw cloche or boater styles? Turbans? Fedoras? If you don’t have any interest in hats, that’s fine too. Some of my best friends are happily hatless. Valerie: Start simply, perhaps with a black beret, so you can get accustomed to the idea and see how it works with your hair. Then branch out into simple hats with colors that match your wardrobe, and graduate to hats that (so to speak) turn heads. Don’t buy a hat just because everyone else has that style of hat. When people say “Hats don’t look good on me,” my response is “You chose the wrong hats for your face, hair and outfit”. Would you say “dresses don’t look good on me” because one time you tried on a Herve Leger bandage dress and it didn’t suit you? Valerie: Everything in my wardrobe is architectural, textural, and/or graphic. My favorite clothes make me ask myself “what was the designer thinking when (s)he made this?” I love it when designers break the rules, try a new twist, go against the grain, break the mold. Some of my clothes have a sly sense of humor and need to be looked at closely. If no one but me gets the joke, it’s okay. It’s like I have a delicious secret, or like I’m sharing one with the sly designer. Jean: My style is “Goth meets Sunset Boulevard” or Amish Goth. I love the art deco period and the glamorous clothing as well as the 1970s punk look and 1980s power suits. I like to mix it up a lot. I don’t do hippie or ethnic because it just doesn’t “feel” right on me. 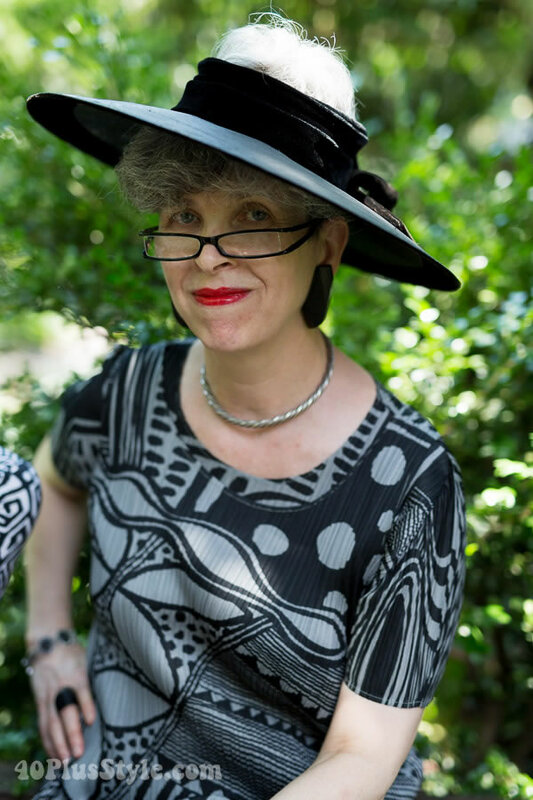 Although we have friends who do, I do not wear full historical vintage (Edwardian or Victorian) outfits, but I may occasionally wear a Victorian straw hat with a veil and mourning jewelry paired with an Issey Miyake jacket. Jean: My look is more avant garde than traditional. I don’t own any knee-length dresses or suits. Everything is long, sometimes full, sometimes very narrow, mostly architectural. “Body con” is not a look I would be going for. Valerie: I think it boils down to a playful intermix of colors, shapes and textures. Whether I do that with a skirt, dress, pants, or accessories is secondary. Valerie: Living in New York, I have a lot of warm clothes, lots of long sleeves, lots of wool, lots of pants and lots of coats. I still haven’t perfected my summer wardrobe. The New York humidity makes it very hard to stay cool and looking stylish at the same time. Jean: Although I was born in Washington, DC and didn’t move to New York until after college, I’ve been here for so long (since November 1974), I consider myself a New Yorker. Although I don’t have a New York accent, I am on “New York time” and when I leave town and travel to other cities, I feel like everything is in slow motion. 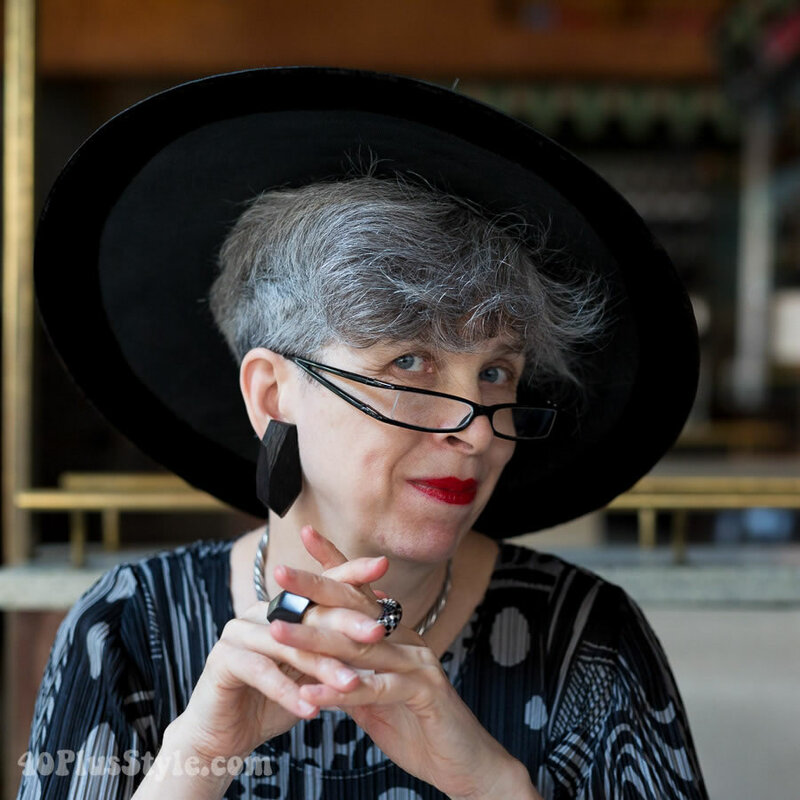 Likewise, my sense of style is what others most associate with New Yorkers (i.e., lots of black clothing, accessories and eyeglasses; geometric haircut; statement jewelry, at least 10 rings, and a hat) and I walk and talk at a very fast pace. When I meet new people in other cities, they always assume I’m from New York. When someone says “Oh, you must be from New York”, I take it as a compliment, even when it isn’t meant to be. Jean: Yes. I wear my silver and grey hair in a signature bob with bangs and black sunglasses 24/7. I used to wear almost exclusively black but have gradually added white, so I have a lot of black and white outfits and accessories. Occasionally, I add colored accessories, including hats and jewelry, but infrequently wear colored clothing. I have a large collection of Bakelite jewelry – necklaces, bracelets, rings and earrings – that I incorporate into my outfits. I don’t wear traditional dresses or pant suits. I wear unstructured sometimes voluminous, sometimes lean, very well constructed clothing by American, Japanese, Danish, Israeli, British, French, German and Italian designers. I almost never pay retail, relying instead on consignment stores, vintage clothing shows, flea markets, outlets and sample sales. Valerie: Yes. People often tell me they know me by my clothes even before they see my face. Not sure how I’d describe it, though. Valerie: If I’m going to work, I dress down – jewelry gets in my way, and I wouldn’t want to accidentally stain or rip my favorite things. If I’m going to an event, I like to wear something that plays off my surroundings: vintage to a vintage show, a crinoline to Bard’s recent exhibition on women’s underpinnings, a painted jacket to an art show, something eye-catching during Fashion Week. Like any woman, if I have something new, I’ll do my best to finagle a way to wear it, even when it’s a bit of a stretch to make it suit the occasion. When dressing for any occasion, sometimes I start with the outfit and pick accessories to suit it; other times I’ll pick an accessory and build the outfit around it. If I have time, I conduct little experiments, combining contrasting elements that seem outlandish to me. Often they are just a bad combination, and those never see the light of day. But sometimes the results are more fun than anything I could have bought off the racks for $1000 (i.e., waaaaaay beyond my budget). I love it when I have the chance to put one of those on the blog. Jean: Weather inspires my outfit choices on a particular day. I love drop-crotch harem pants, outsized, controlled volume pants and dresses (think Kedem Sasson, Yohji Yamamoto, or Ivan Grundahl) made of interesting fabrics. One piece may be the building block for everything else around it. I love wearing platform shoes – actually, they’re more like flat-form shoes, with very high soles but not much of an incline from the ball of the foot to the heel. And of course, hats inspire me and I’ve been known to select an outfit based on the hat. Since I travel a lot, almost all of my clothing (except for special occasion pieces) must pack well in a suitcase. Although I store structured hats in large, stacked hat boxes, I do have several foldable winter and summer hats that pack well, including a series of ingenious “origami” hats by milliner Amy Downs, which fold flat to store or travel. Jean: I do wear a lot of black or black and white and don’t really follow color profiling based on my complexion, eye and hair color, especially since my hair turned salt and pepper and is turning saltier as time goes by. I am aware of my body type but may sometimes intentionally wear clothes of somewhat exaggerated proportions that are outside the boundaries of traditional body type considerations. Because I am not tall (under 5’4”), I like to wear platform (flatform) shoes and tall hats to extend the line of my clothing. Valerie: Yes. I have ‘rules’ for color and shape, but I follow them the way I follow the rules of grammar – without consciously thinking about them. On the other hand, just as it’s sometimes effective to say ‘ain’t’ to make a point, it can also be effective to wear a dissonant color or shape. I’d say our best designers do that all the time, and so skillfully that we don’t even realize they’re doing it. Valerie: My style changed somewhere around 50. I had about a five year period, while I was going through menopause and needed foot surgery, when dressing morphed from a joy to a chore. Now both are over, and I see myself returning to some of my earlier styles, but with important differences. All my shoes now must be flat, and all my clothes must take into account my changing muscle tone. Jean: My style changed in my 40s from my 30s, but it changed the most dramatically in my 50s and onward, with emphasis on “dramatic”. Once I figured out that there weren’t any rules, except for the occasional work commitment, I could wear what I wanted. I do not have a casual wardrobe. What I wear on Fridays is what I wear on Mondays. That can be intimidating to some people. But I believe in dressing in a way that is the most flattering, so I wear the clothes that I think make me look my best. I don’t even own a pair of blue jeans. Jean: I definitely believe in dressing “age appropriately” but my definition is probably marking on a curve. I definitely do NOT want to look like everyone else. I do not want to look like a “Cougar” — or a frump. I want to look stylish and “dressed”. It is a conscious choice. I find it interesting when I encounter women of my age in their sixties showing an inappropriate amount of flesh. Just because you can show it doesn’t mean that you should. I also dislike anything that looks like someone is “trying too hard” to be something or someone they are not, in order to please someone else – partner, children, peers. Valerie: I’m not very interested in fashion – it’s in one year and out the next. I’m interested in style as a form of self-expression. It may not be fair, but it definitely is true that people command more respect when they’re well dressed. 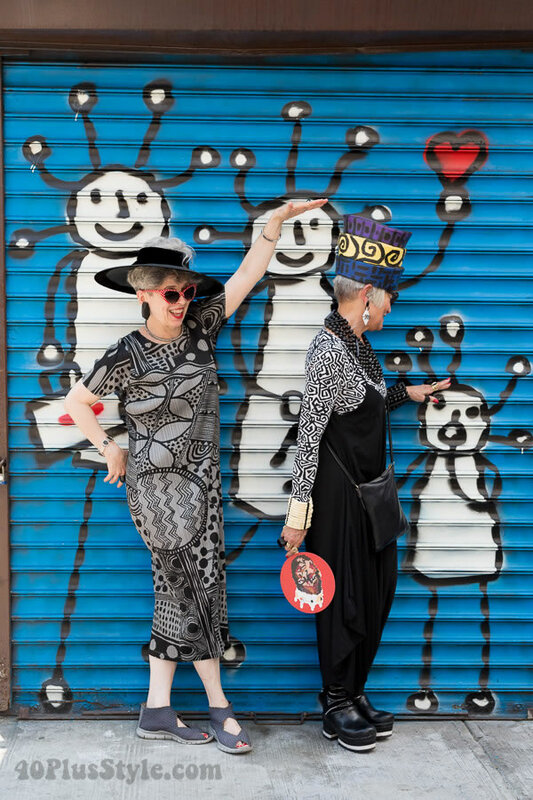 Since older people often suffer subtle or not-so-subtle discrimination, and feel relegated to the background, dressing with style can be a way to maintain one’s place in the world. Jean: “What she said!” Fashion for me is now a spectator sport: I love fashion magazines and have been reading them for 50+ years and enjoy watching the trends. I like observing the changing silhouettes and color palettes and fabrics each season in much the same way as an anthropologist would examine a foreign tribe or culture. That said, I always have been and continue to be interested in style and want to look my best. Admittedly, what I think is “my best” is not everyone’s cup of tea, but I know exactly what I want to look like and act and dress accordingly. Jean: There is truth in that old adage that when you look good, you feel good. I know what I want to look like and do my best to achieve it. I don’t worry what anyone else thinks. That’s one of the perks of getting older. Valerie: I always feel better about myself when I’m happy with the way I look. And others react positively to the positive image we project when we’re comfortable with ourselves. I want to look my best, but that doesn’t mean I want to look young. Looking one’s best is for people of all ages. 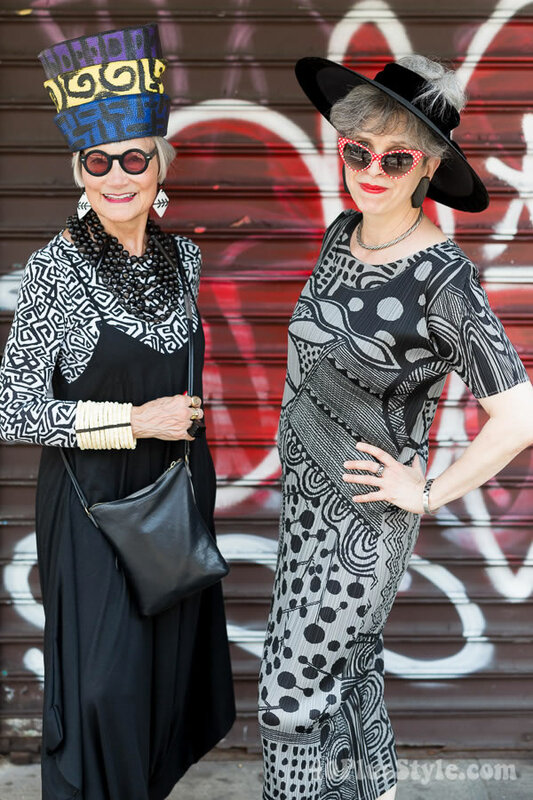 Jean: I don’t follow trends and feel that clothing manufacturers ignore older women. Certain trends cycle in and out. Once you’ve been through them a couple of times, you realize they were better the first time around and attempting to recapture the past often goes wrong. For example, the New York Time’s just-published Fall Fashion Issue of its Style Magazine includes a market report featuring 8 pairs of wide square-toed shoes with chunky heels. Been there, done that. Short boots are “back” too, but when you are a short woman, it isn’t always such a good look. In a section titled “Remains of the Day”, the Times declares that “the coolest look this season references the layered eclecticism of all that came before, from ‘70s floral-print suits to ‘40s-era net hats, from oversize shearlings to logo sweatshirts”. Really? When it evolves naturally, style can be great. When it is dictated, fashion loses the spontaneity. Valerie: I don’t follow trends – for the most part trends are not suited to the older body. I must say, however, that I am intrigued by the strong lines inherent in the structures of “cages” and “harnesses”, and how they redefine the body. 1. Don’t dress according to a rigid thing like “age”, because what’s right for you is not right for your friend of the same age. Dress according to your body. We have seen women of all shapes, sizes and ages – women who will (unfortunately) never appear in the fashion magazines – who have figured out what works for them and could teach the magazines a thing or two. They look GREAT, exude confidence, and are comfortable in their own skin. They don’t need to wear diamonds or sequins to shine – they sparkle on their own. 3. If your priorities are elsewhere – your garden or your grandchildren, for example – don’t feel pressured into working on style. Young people feel duty bound to conform to social pressures, but as we age and learn our own strengths, we are more able to make decisions based on our own personal wants and needs. Style is an option, not an obligation. What are your plans for your website and how do you see it develop over the coming years? Jean: The blog continues to evolve almost organically. We cover a lot of events as members of the press, which expands our horizons and our experience and use the blog as a way of communicating what we found interesting at the museum exhibition, gallery show, fashion show, or vintage show, and why. We compare notes and share our thoughts and try to distill the event. Instagram is a much more immediate, real-time response to a person, an event or something that caught our eye – graffiti, flowers, traffic, crazy New Yorkers, whatever. I started our Instagram account, and Valerie began adding to it after she (finally) learned the basics of operating her cell phone, so now we post independently, without prior consult. Many of our contemporaries do so too! Most of our friends don’t blog, some do Facebook, but dozens of them do Instagram. It’s a much more go-with-your guts approach to social media. We’re interested in knowing what the next big thing is going to be. Recently, as a result of our work, we’ve been guest speakers at universities with fashion and design programs, where we’ve talked about issues that older women face when purchasing clothes. The purpose of our talks is to open future designers’ eyes to the fact that one design does not fit all, and suggest solutions that have worked for us. The response was excellent. With the population aging (AARP notes that one American out of three is over 50), older women are a large yet underserved segment of the market. We hope to continue speaking in public forums. From there, we would like to use our expertise to consult with design houses to help them raise their market share by responding to older women’s desires to dress both stylishly and comfortably. Valerie: I agree. I’d also be interested in hearing what you and your readers think we should do next. Listen to them in this short interview as I ask them about style and their gray hair! We’re grateful that you reached out to us and that we had an opportunity to meet and talk to you. Isn’t that another happy consequence of blogging? We’ve met so many interesting people through our blog. Some in person, and some only on line so far, but it’s been a wonderful tool for meeting likeminded people worldwide, exchanging ideas, supporting one another, and building a collective voice. For many more photos and stores be sure to check their website Idiosyncratic Fashionistas or Instagram account! If you enjoyed this interview and photos, I hope you can share on social media. Share buttons are available on images and below this article. Just fabulous! So grateful for the opportunity to meet and photograph such incredible women! I will read and watch the video over and over. 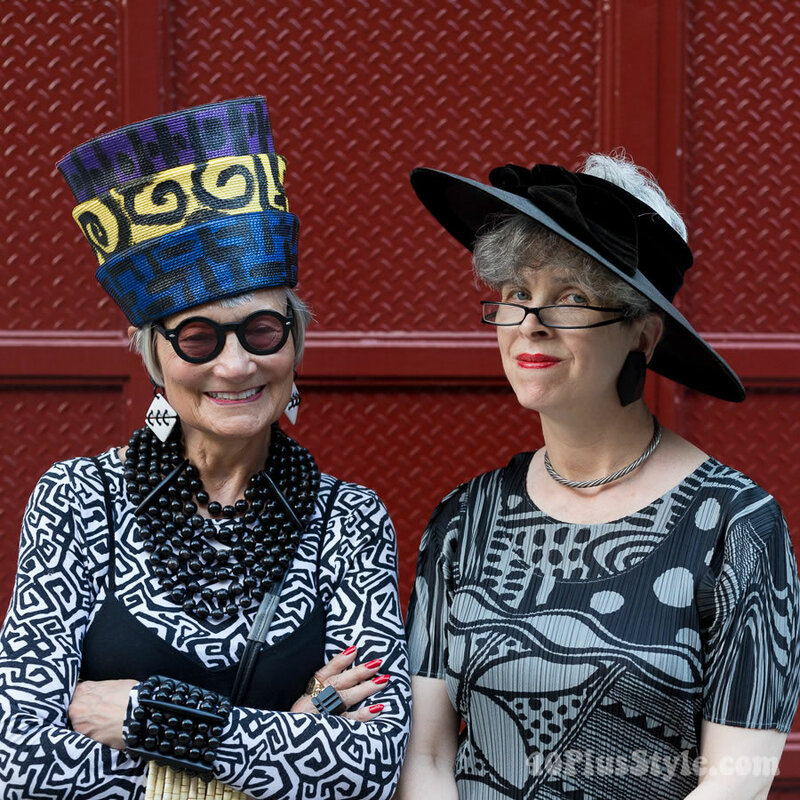 I really enjoyed the interview and look forward to checking out Idiosyncratic Fashionistas! Focusing on style over fashion – something I find more and more to be true for me. I enjoyed getting to know more about Valerie and Jean. They have magnetic styles individually but when they are together, BAM! Cool women. I also enjoyed your video interview, Sylvia. I like to find out if the voice I imagine people to have syncs with their real voice. What a terrific interview with Jean and Valerie. Valerie’s distinction between fashion and style was illuminating. Jean’s fearless individualism is inspiring. Bravo ladies! Thanks Sylvia! What a great interview – so in depth. Thank you all. I adore Jean and Valerie, and you have captured their essence perfectly. They are stylish, witty, kind and generous. Fabulous interview. Sylvia and Denton, it looks like you’re having a wonderful time! Great interview, great ladies, great photos. I really enjoyed this post. Of course I know Valerie and Jean, but it was very nice to get this insight in their life and choices. I loved the interview with Valerie and Jean. So many words of wisdom and insights that I identified with. The section on wearing hats was wonderful. I don’t know why but I’ve had a constant urge to wear hats as I age. 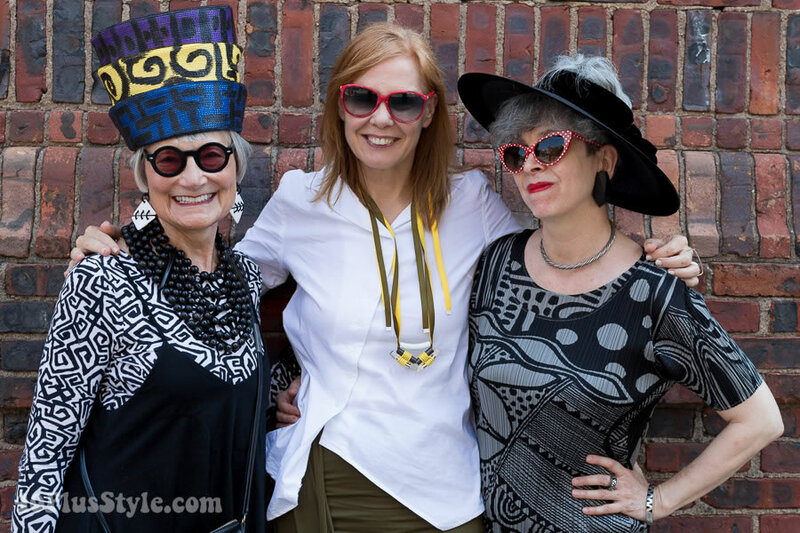 I loved Valerie’s quote: “I see myself returning to some of my earlier styles, but with important differences.” It is somewhat disconcerting to see one’s clothes returning to the fashion scene and one’s toys and possessions showing up in antique stores. I want to revisit some of the earlier styles I loved without looking ridiculous. V and J provided valuable guidance. 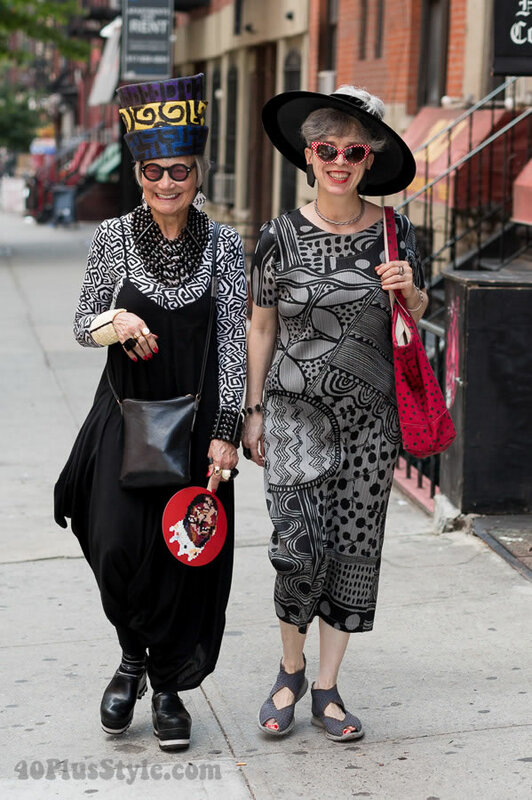 What an inspiring ladies, I hope I can take a photo of them too for my blog when I’m visiting NY in September. I enjoyed the video as well as the pictures, well done Denton! 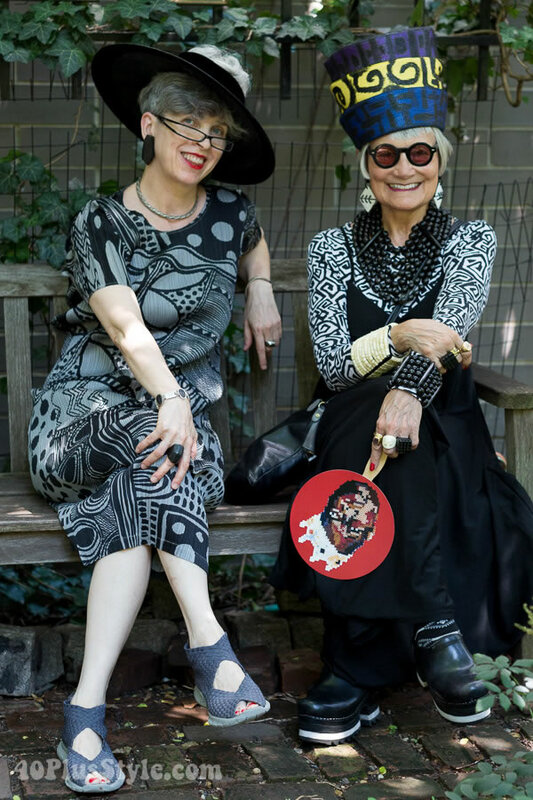 A wonderful interview with such great photos of these two stylish and so interesting women. 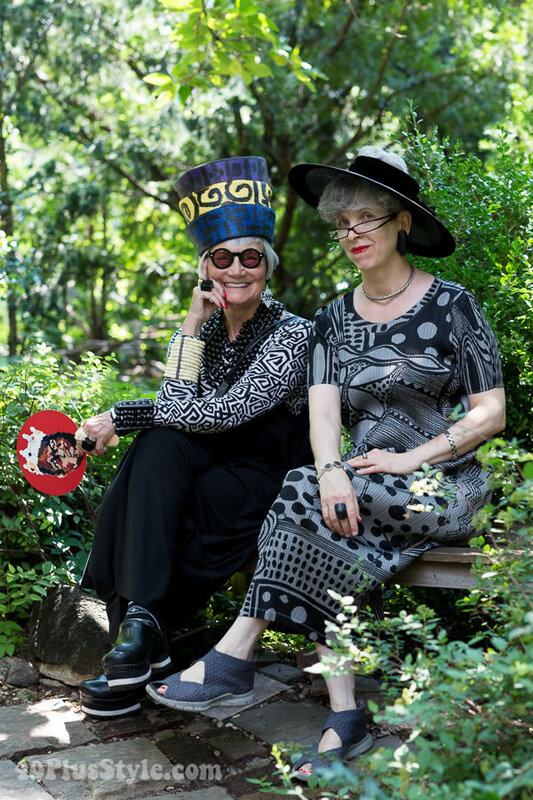 I have followed Jean and Valerie for many years and so enjoy their blog and seeing New York through their eyes. Next post: #Style inspiration: Black & White – Choose your favorite from 20 looks!